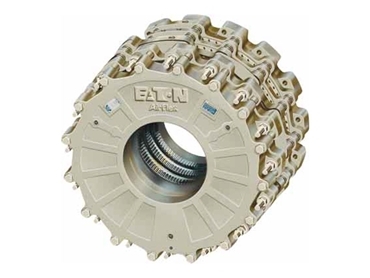 Eaton Hydraulics Group Australasia offers Airflex WCSB brakes designed to eliminate the need for multiple braking systems. Designed for dynamic tensioning, static holding and emergency stopping, Airflex WCSB brakes are water cooled and air cooled disc type brakes. These brakes are typically used in drawworks, mooring systems and log yarders. The WCSB incorporates water-cooled and air-cooled friction discs within one brake that is pressure applied and spring applied. The pressure-applied side is used for dynamic tensioning while the spring-applied side is used for emergency stopping and holding. Pressurising the air-applied side causes the piston to clamp the water-cooled friction discs between the water jackets. Following pressurisation of the air-applied side, air pressure must be applied immediately to release the spring-applied side. Applying air to the spring-applied side pushes the spring-applied cylinder back and releases the air-cooled friction disc, preventing free fall of the load. Once the spring-applied side is fully released, air pressure is slowly released from the large and small pistons on the air-applied side until the load begins to move. Releasing air-pressure from the spring applied side causes the cylinder to move forward, clamping down on both the air-cooled and water-cooled friction discs during an emergency stop or for static holding. The air-applied piston incorporates a small and large piston, with the small piston used to provide air pressure that can be managed by standard regulators, which increases controllability during the tensioning mode with light loads. Element sizes are indicated by the number of water-cooled friction discs, the number of air-cooled friction discs and the disc diameter in inches.